It all makes sense at the finish line. The quest to cross a finish line has a life of its own. These are journeys of self-discovery, pain, joy, inspiration, defeat, and victory. When I cross a finish line everything falls into place. Exuberance, relief, pain and glory describe pieces of the feeling, but the emotional totality of crossing that line has yet to be accurately put into words. I had slowed to a painful walk with three miles to go at my first Ironman Lake Placid, each excruciating step a reminder of the hours I hadn’t spent training. Mustering the energy to speed up to a half run took a courage and resolve I never knew I possessed. With three miles to glory I summoned everything and jogged. The louder Mike Reilly’s voice got telling finishers they were Ironmen, the faster my legs were willing to carry me. I was drawn to the finish line like a strengthening magnet. When I hit the Olympic Skating Oval, jam packed with hundreds of enthusiastic supporters cheering their faces off, I achieved a full stride run and finished with a flourish of high fives and a burst of energy I hadn’t felt all day. It was miraculous, and over time I’ve come to realize that finish line is mine to tap into, forever. How do you cross the finish line as a manager? You may say every day ends at a finish line, or every challenge or deadline, but that’s too simplistic. Finish lines are special, never mundane. Their power lies in in a unique, deliberate struggle, one of your choosing. As a leader, the most worthwhile finish lines are those you create. They should be limited to a doable number at any given time, written down, and mapped. Some should be personal, some involving a few people, and others involving your entire team or organization. I’m getting my Master’s Degree. My recruitment team and I are revamping the hiring process to make it faster and more efficient. The entire management team is going for a top 10 finish in a Best Places to Work survey one year from now. Each goal is doable, timetabled, measurable, and has a clear finish line at the end. If you continue to raise the bar as you begin successfully crossing the finish lines you set for yourself and your team, success will become a way of life. And, make sure you always celebrate at the end, telling war stories and recounting lessons learned. We’ll always have projects thrust upon us with deadlines and goals, but nothing is more valuable and satisfying than setting your own finish line, reaching it, then looking for another. You’ll find strength along the way you never knew you had. 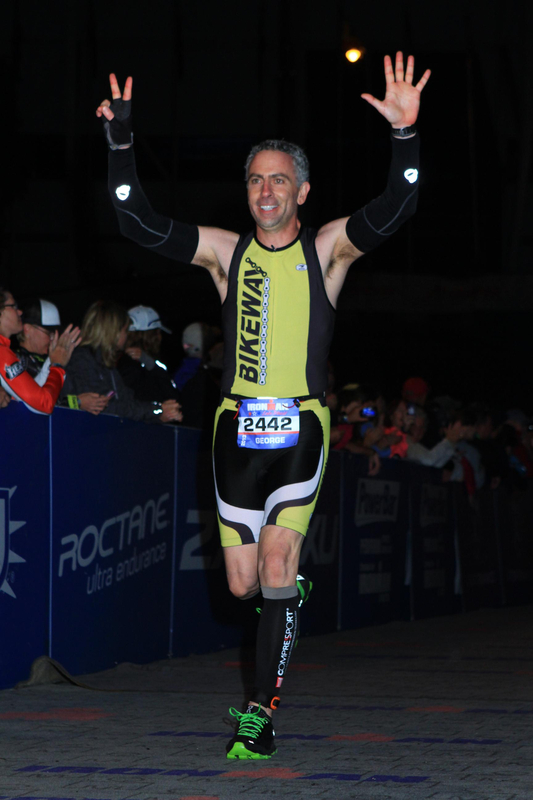 This entry was posted in Athlete Training, athletic performance, Coaching, management style, Management Training, personal development, Uncategorized and tagged goal setting, goals, Ironman, Ironman Lake Placid, Ironman Triathlon, Kona District Hawaii, Lake Placid New York, Management, management style, management training, Mike Reilly, Sports, team building, Triathlon. Bookmark the permalink.